Washington, DC – The Department of Homeland Security has awarded the International Association of Fire Fighters (IAFF) a $2 million contract to develop a new pressure vessel that will make the self-contained breathing apparatus (SCBA) worn by first responders substantially thinner and lighter. Smaller, lighter SCBA will improve fire fighter safety. “The IAFF is proud of its record as the leader in the development of projects that provide direct benefits to fire fighter health and safety. With all the recent technological developments and new materials we can work with, it’s time to fast-track the introduction of new, lighter, less stressful, but highly protective equipment,” IAFF General President Harold Schaitberger said. The cylinders that contain the pressure vessels in existing SCBA account for much of the weight and size of the units. The weight and profile of those cylinders has been associated with increased rates of injury and fatalities for emergency responders. The IAFF is working with Vulcore Industrial in Fort Wayne, Indiana, to use technology, engineering and new materials to modify the pressure vessel in a way that will reduce the weight and make it smaller and more flexible. In initial prototype designs, the new pressure vessel offers an approximate 60 percent weight reduction over conventional SCBA cylinders. Prototypes also have a substantially smaller profile, measuring two inches in depth. Pressure vessels on conventional SCBA cylinders measure seven inches in depth. The design braids new, thin, tubular pressure vessels in the harness assembly, instead of the large cylinders used today sitting on top of the harness assembly, allowing for greater mobility in confined spaces. Unlike conventional cylinders which contain air pressures up to 5000 psi, the new vessels won’t fragment if they’re ruptured. A punctured pressure vessel would simply vent contained air. 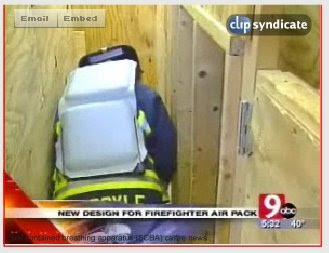 Members of Fort Wayne, IN, Local 124 have tested the prototypes in simulated confined space entry. The IAFF’s contract with DHS spans a 15-month period. The research and development is expected to result in a new, commercially available SCBA. “The IAFF is confident that a new generation of lighter, low-profile SCBA will be available to the fire service when this important research concludes, and our members will be safer for it,” Schaitberger said. The DHS contract to the IAFF spans a 15-month period to advance the new technology toward commercialization. This effort includes getting the necessary government approvals for the new pressure vessel, working with the SCBA industry to integrate the new pressure vessel as part of existing SCBA, fulfilling government and NFPA standards certification requirements, and carrying out field testing to prove the benefits of the new technology. The IAFF Project Team, which also includes International Personnel Protection, Inc., based in Austin, Texas, is working with a Technical Advisory Committee, which is providing input for the integration, testing and introduction of the new pressure vessel technology. At the first meeting of the Technical Advisory Committee, several factors were identified that will help with ensuring a smooth transition of the fire service to lower weight, thinner profile SCBA. For example, since only one system can be initially brought through various required approvals and certifications, the advisory group opted for a 45-minute service life rated system. Amazing new SCBA represent a significant improvement in personal protective equipment. Harold Schaitberger, general president of the IAFF, has prioritized this effort to ensure his membership has the latest technology to minimize firefighter and other first responder stress during emergencies. "The IAFF has a long history of promoting new development projects that provide direct benefits to fire fighter health and safety," he said. "We feel that the time is right to fast track the introduction of new technology that will allow firefighters to respond lighter with a higher degree of safety by using less stressful, but highly protective equipment. At the end of this project, the IAFF is confident that a new generation of lighter, thinner SCBA will be available to the fire service." Within the next two years, the new SCBA technology is likely to change the way that the fire service and other first responders look at SCBA and the missions that require air-supplying systems. Not only will the firefighter ensemble look different, with sleeker, lighter SCBA, the improvements for stress reduction and confined space mobility will be dramatically improved. Most importantly, the new technology will represent a paradigm change in the industry the same way that positive-pressure SCBA afforded firefighters substantially higher levels of safety and health compared to previous respirator use. A Technical Advisory Committee of IAFF members will provide input for the integration, testing and introduction of the new pressure vessel technology. At the first meeting of the Technical Advisory Committee, several factors were identified that will help ensure a smooth transition of a new SCBA to the fire service. The International Association of Fire Fighters, headquartered in Washington, DC, represents more than 292,000 full-time professional fire fighters and paramedics who protect 85 percent of the nation’s population. More information is available at www.iaff.org. 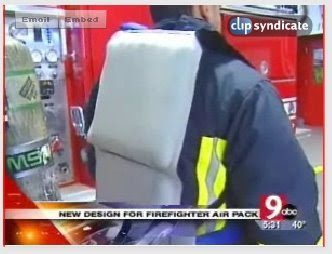 On the plus side, if the IAFF can produce a modern lighter thinner SCBA that is up to safety standards, it will add more time for firefighters to act when using them, as the reduced weight will help conserve their energy, making breathing calmer for longer.